And 7 reasons why you shouldn’t. Bunnies are some of the cutest creatures on the planet! (In my opinion) When I met my boyfriend he came with a little black rabbit and I was immediately in love. When she passed away from old age we really didn’t waste any time to expand our family again. The adoption agency we went through had SO many bunnies to choose from, we chose a bonded pair of Flemish giants Pepper (black one) and Clover (brown one). With so many adorable bun buns up for adoption I wanted to take some time to talk about these amazing creatures in hopes I can inspire someone to take a bun home. The decision, however, should not be made lightly. Along with reasons to adopt a bunny I will also list off the reasons why someone shouldn’t adopt one. Clover enjoying a hosta and our cat looking so confused! You have someone to share your snack with. Want an apple but don’t want to eat the whole thing? No problem, cut it up and share with your bun! They have unique personalities. The character can be seen very quickly and not one is the same. Their litter is compostable and will do great things for your garden! They are clean animals and are easily litter trained. They are the softest thing you’ll ever touch. They are very social and won’t ignore you like a cat. Little lawn mowers! Some supervised outside time is a ton of fun and you get a free (albeit not even) lawn mow and manure! Overall rabbits are great, however they are a lot of work. Now for some reasons a rabbit may not be for you. They love chewing on boxes! And using them as houses… And eating their houses. Maintenance, if you’re not ready to change a litter box daily or every other day, a rabbit may not be for you. They poop A LOT. If you’re allergic to hay: that’s their main food source. If you’re busy: Bunnies are very social creatures and can get lonely and depressed if left alone for too long. If you’re a clean freak…. There’s always shavings and hay everywhere.. Everywhere. If you have hardwood floor. Bunnies don’t have pads on their feeties like cats do so they can’t get traction on hard floors. Carpet all the way! Also, bunnies do NOT belong in a cage. They need to hop, stretch and roam- give them space! If you’re not ready to let them own your house, a bunny is not for you. They love cord. They find them. They destroy them. They can break your heart… We lost miss Clover suddenly due to an inner ear infection. She was gone within 48 hours from when the symptoms started. Even getting her to the vet and getting medication as quick as possible wasn’t enough to stop it. Rabbits also have sensitive tummies and can have issues quite quickly that can be fatal. And we lost Pepper almost as fast 4 months later from suspected kidney failure. You need to be strong to handle the heartbreak. He looks dead but I promise this means he’s a happy boy! To summarize: Rabbits are great, but make sure you’re ready for that much poop. And I’m sure as you have seen in my photos, your floor will only be clean for about 20 minutes after you vacuum. A thing to remember as well is that these adorable creatures are prey animals so make sure that any other animals in the house know these cuties are friends not food. Make them safe, happy and healthy. They’ll thank you with nose boops, flops and the occasional lick and it’s amazing. Some things I’m finding it difficult, my municipality requires me to put my kitty’s poops in a plastic bag before disposing (I get it, that urine is filled with bacteria), so until the day comes that Halifax figures out how to use animal poop as energy I am trapped in a cycle of plastic bags. This however, has not deterred me from making as many changes as I can to reduce my waste and plastic use. Its a very slow process but slow is best because the whole process can be very overwhelming… You don’t realize how much plastic you use until you look around. The bathroom is a terrible place for plastic waste (mainly for sanitary reasons) from makeup to the toothpaste and body wash it’s all encased in a plastic shell. It’s a slow change over in the bathroom, I have found a cosmetic company that makes their containers out of Bamboo (bonus points for being Canadian) https://elatebeauty.com/ they are also cruelty free and vegan and the containers are reusable! For soap… I exclusively use bar soap which thankfully comes in a cardboard box, I also dabble in homemade soaps from my local market when I can. The shampoo and boyfriend’s body wash however is something I have yet to tackle. Lastly toothpaste…. I’ve read articles on people making their own to avoid the waste, this is certainly something I intent to look into but I am still a little ways out for that step. My kitchen has been my main focus, I love to cook and bake as it is so leveling up my skills by making homemade condiments, breads and sauces has been an easy transition. I was pleased when I looked in my fridge the other day and the only single use plastics were the milk jug and a package of bacon. The pantry has been incredibly easy with stores like the Bulk Barn allowing me to bring in my own containers which keeps things affordable. Costco is also my best friend with having nice big 10KG bags of flour to take home and utilize. I’ve also started reusing as many containers as possible, reminds me of the memes you see of trying to find the butter an Grandma’s because she has leftovers in all her reused containers! I remember my mom talking about her mother saving the wax paper that came in the cereal boxes to wrap sandwiches in.. This is me. The cake business will most likely be my last venture once I get my personal waste use down, I know there will be challenges with freshness that will come up so I’ll be taking that one step by step. I will be sharing recipes as I find ones that work. I’m currently experimenting with my favorite snack- Beef Jerky along with a Mustard recipe that tastes like French’s … Still some work to be done on both. 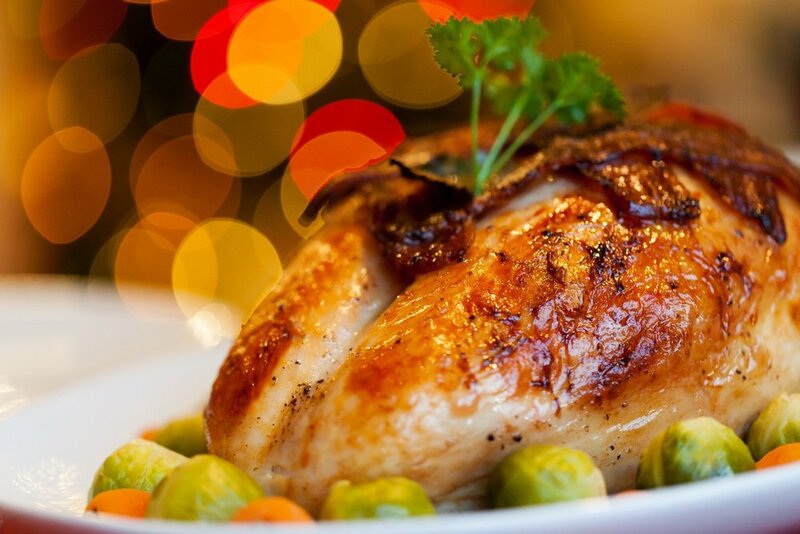 I found myself with a very large turkey after the holidays were over, which was very exciting to meal plan with. One delicious gem I made was a turkey pot pie. Turkey can be so dry if not prepared properly but smothering it in this pot pie will never feel dry! I got the opportunity to sample Love Beauty and Plant Shampoo and conditioner for testing. Although I received the products for free, all the opinions are my own. They are a cruelty free, plant sourced brand with lots of positive product points. The shampoo and conditioner made my hair feel soft and was easy to brush. I would definitely purchase a full version of this product. My only true critique would be that it’s another in plastic product. To take it to the next step, a reusable container would really rise the company above the rest. There are plenty of natural products on the line these days so now the challenge becomes putting the product in something that is biodegradable or refillable. I got the opportunity to receive the Hello Flavour Sample box complimentary from Influenster for testing. All the opinions in this post are my own. Lately, Influenster has been sending me make-up samples and with my decline of wearing makeup it was getting a little annoying reviewing things I really don’t use on a regular basis. So, getting a box of spices was a breathe of fresh air because I love love LOVE cooking and of course it’s no secret I am an avid baker. In the box I got some kitchen staples: Cinnamon and Allspice, and some new things to try: Harissa and Black Garlic. As expected, the batter was a nice texture that mixed and scooped well. It didn’t quite make the 24 cupcakes but I made a few of them a little big. After they cooled I decked them out with my own homemade icing and some red sugar to symbolize the kick in the cupcake. The Verdict: the initial bite isn’t bad, you just taste chocolate. However, then the aftertaste comes and it’s a disgusting sour mess. I made it through 2 bites of the cupcake and gave up. I thought that since I’m not a huge fan of eating sweets, it may have just been my taste buds so I got my boyfriend to try one when he got home. Same verdict, they were gross. To summarize: These cupcakes were gross. I tried to like then, I tried to find someone who liked them but the end result was these cupcakes ending up in the green bin. I bet that spice in something appropriate would be delicious, it smelled great in the package. I’m disappointed that I wasted my sample in those cupcakes. I’ve cooked with real black garlic in the past, it has a very unique texture and flavor to it so I was very curious if this spice would be able to hold it’s own. 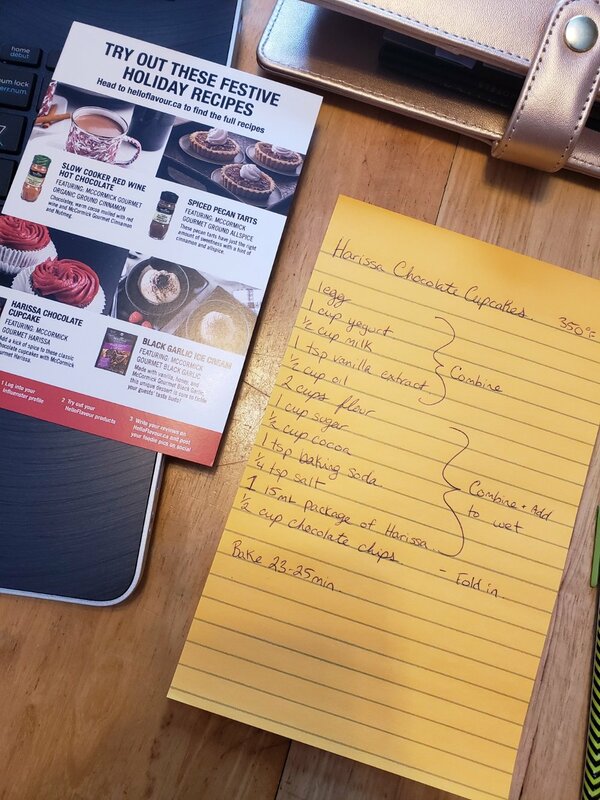 The recommended recipe was to make a sauce for ice cream………………….. After the cupcake incident I decided to use one of my own recipes to try out the spice. 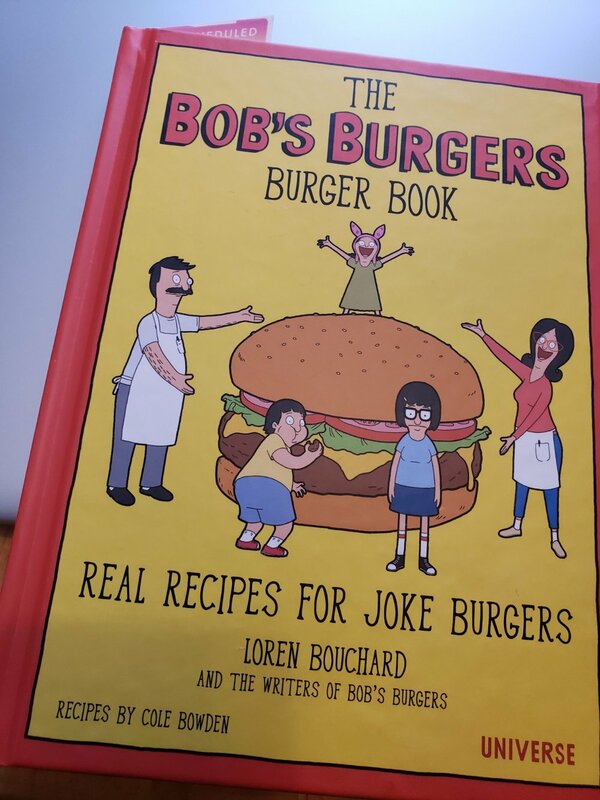 I chose one of my favorite cook books: The Bobs Burgers Burger Cook Book! I chose to make the “Bet it all on Black Garlic Burger” I’ve tried it with the real black garlic and it was indeed… Exceptional Mouth Feels….. Instead of using real black garlic, I substituted the package of spice in the mayonnaise. I also had to adjust the greens to kale just due to availability at the market. The Verdict: ……. Exceptional Mouth Feels. Now it’s definitely not as good as the real thing BUT for a dried spice it did capture the unique smell and taste of the black garlic without the mess of dealing with the actual garlic. I will buy this spice, this is definitely a new staple in my spice cabinet. I didn’t go into depths for the Cinnamon and Allspice because I think we all know what those spices are like and what recipes they work the best with. I am so relieved that I used my own recipe to test the black garlic as opposed to the recommended one because I would have been quite disappointed if both samples were wasted. I get it that Hello Flavour is trying to have innovative and different recipes… But I would think they would make and test out a recipe before promoting it? Just my thought on it. Next up: about a week later my father in law was diagnosed with stage 4 cancer. Then of course the #3 was that I caught Mono… Grown woman caught the “kissing disease” I was thrilled. After a quick scan of the internet to better understand what is going on in my mouth and body I realized that there’s really not a lot of information available..
You’re gonna be tired for awhile. My throat was on fire. My lymph nodes swelled up so big it felt like there was 2 golf balls in my neck. It horrifically restricted my vocal cords. (TMI) I was producing so much phlegm every few hours I had to vomit to relieve myself. It was easy though- just took a deep breath, and away we went! Oh yeah I was tired… One day according to my Fitbit I slept for 16 hours. My head was on fire and no amount of drugs helped. Ice pack would bring some relief. The flu like symptoms (fever) were the easiest part of the whole experience. No brain power, couldn’t even read… I spent a week and a half playing idle games on my tablet when I wasn’t sleeping. Killed me. Yes, it is spread by saliva but it can be contracted as easily as touching a shopping cart. (infected person touches face then touches cart; I then proceed to touch cart and touch face) This realization on how easy it spreads was a relief, because looking at the internet information made me more confused and frustrated than anything: how did this happen? I don’t share drinks, I don’t kiss random strangers… How did this happen? You essentially have tonsillitis without being able to medicate it with antibiotics. The only thing you can do to recover is rest and hydration because it’s viral and not bacterial. Working an 8 hour day is impossible, and I was immediately pulled from work. I couldn’t believe the extreme symptoms from Mono, with no ability to mediate it aside from some pain killers. The information available really sugar coated the whole experience- it was a personal hell. I wanted to take some time to talk about it because it was so much more extreme than anything that is available on WebMD or whatever you choose to use to try to diagnose yourself while you wait at a walk-in clinic. The biggest thing I learned through the whole experience was rest and hydration is the most important thing. Even after my energy came back, I could only do something for an hour or two before I needed a rest. I was so lucky that I started to feel human again after about a week and a half when my taste buds came back I thought I was in the clear. Unfortunately, my doctor didn’t feel the same way. Giving that it’s a serious viral infection she only wanted me to start back up at work 3 days a week.. So for the rest of 2018 I’m only working Monday, Wednesday and Friday’s to give myself a day to recover after a day at work. It’s a weird feeling after working full time or very close to since I was 16, and I can’t take advantage of the days off like I would like to… But it’s giving me time to reflect and brainstorm life. I’ve been told by loved ones and physicians who barely know me that some of these extreme symptoms may have come on because I push myself too much… That was really food for thought because I’ve always been proud of my busy lifestyle. I guess as you get older it’s not as easy to keep going in all directions. The rest of this year I’m going to work on improving myself physically and mentally and hopefully something like this won’t happen again.. (thankfully you can only get mono once in your life) I still can’t exercise much so I’m considering taking up light yoga and meditation. One last thing I will say as well, I am so grateful to have a family doctor. In Nova Scotia it’s a rarity right now- most are stuck on wait lists because our family doctors are retiring faster than they are being recruited. I don’t know where I would be without her right now and as much as I know I need to tone down the amount of things I take on, I’d really like to help with attracting family doctors to Nova Scotia in the future. One of my brides this year wanted to do something a little bit different. She wanted donuts for her wedding day. I am always up for a new challenge so I was happy to accept! Since I don’t normally bake donuts myself I ordered them from a local bakery in bulk and just took on the decorating and display. I was incredibly happy with this choice. The donuts were consistent and took to the icing quite well and due to their stickier nature I was able to transport them right on the stand. The recipe I used for the glaze was simple- icing sugar and milk. I combined those 2 ingredients together until I got the thickness I needed to dip them. I was hoping for a dark burgundy for some of them, unfortunately the icing didn’t really take to the colouring… But I was still happy with the overall look of the display! To keep some dessert tradition in place for this event we also did a “donut” cake for cutting. I matched it to the pink/burgundy donuts and garnished it with some silk roses. I’m hopeful this dessert choice will trend as it was so much fun! I’m personally not a big sweets person (to eat) but if I showed up at a wedding that had donuts I’d be thrilled! I got the honor to do a batch of FRIENDS inspired cupcakes! These were for a bachelorette party which was a nice change of pace from doing * ahem * body part cakes for these sort of events. This post contains affiliate links for some of my favorite products. We went with some awesome quotes- my favorites were “PIVOT” and “It’s the humidity!”. I am a huge FRIENDS fan and the Pivot episode is easily my favorite, I still die of laughter every time I watch it. The humidity quote spoke to me, not only because I have the same issue as Monica when it comes to my hair, but making these cupcakes was in a classic Nova Scotia humid summer. Below is a few items I used to make the cupcakes.